We are Chicago’s first and most experienced Laser Therapy Company, we have helped thousands of people make a difference in the quality of their lives. Ready to stop smoking? Need to lose weight? Through our dedication, experience, and expertise, Laser Concepts of Chicago can guide you to quit smoking and create a happy, healthier you. We help people battle their nicotine addiction through our cold laser technology. Other methods rely on nicotine replacement. Not us. We can help you take the next step to becoming nicotine free with no gum and no patches. Our therapy can help so you don't transfer your addiction to overeating. QUIT SMOKING WITH LASER CHICAGO. 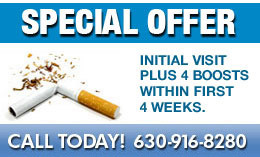 Laser Concepts of Chicago is committed to helping you achieve your goal to stop smoking, lose weight. Our technicians are nationally trained and certified in application and laser safety, and participate in continuing education. We are here to be your support system, encouragement and your help, along the way to improving the quality of your life. We use the healing power of light to stimulate strategic centers of your body. This releases the natural chemicals in your body that are released when you smoke. You can gain the satisfying feeling that you get while smoking, but without ever lighting up! A 25 minute session will be the HUGE first step toward your new smoke-free life! You have already taken a big step by being on our website, take the next step to stop smoking or losing weight and call or email us to set up an appointment today. Remember, our cold laser therapy is painless, fast and affordable. or prevent any disease. Those seeking treatment for a specific disease should consult a qualified physician, prior to using this method.